"Work hard, be nice." This statement, reflecting the ethos of a KIPP school, guided our unique challenge to create an accessible tool that went well beyond a space checklist. With KIPP, we understood the long-term value in empowering these innovative schools to create functional and inspiring learning environments. What makes the KIPP guide unique was our ability, through deep dive conversations with the KIPP community, to re-frame the initial project brief. We showcased to KIPP the power of an adaptable framework that went well beyond a space program and checklist, empowering these innovative school to create inspiring learning environments that are living KIPP. 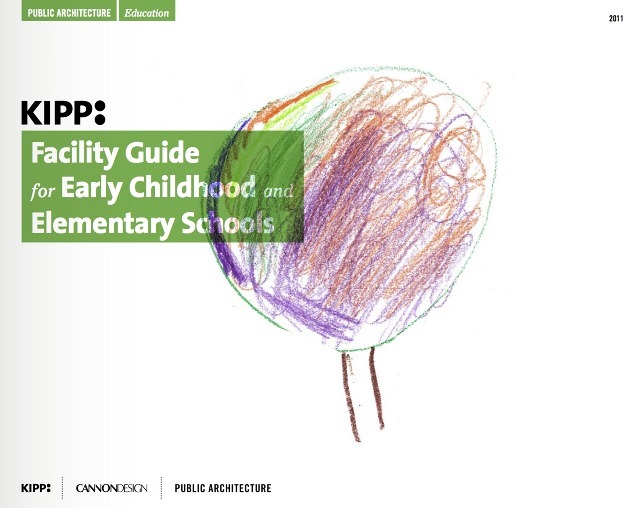 As a result, Cannon Design and the Public Architecture group jointly published the comprehensive Facility Guide for Early Childhood and Elementary Schools. It serves as a pragmatic and vibrant tool for educators, school planners and designers to help identify needs related to early childhood and elementary school learning environments. The 88-page guide’s primary audience and client is KIPP (Knowledge is Power Program), a network of free, open-enrollment, college-preparatory public schools throughout the United States. KIPP has also been a client whose mission is directly aligned with The Third Teacher+ vision for learning. The design concepts in the guide are able to reach a much broader audience, not only for KIPP, but also for early childhood and elementary schools around the country. How can the physical environment support and facilitate the great teaching and dedicated learning that is expected in a KIPP school?